Earths atmosphere is the layer of gases that surrounds our planet. Gravity keeps the gases from drifting off into space. Three-quarters of the atmosphere is located within 11 kilometers of the Earth's surface. The atmosphere thins out as Earth's gravitational pull decreases. The atmosphere becomes thinner and thinner as the distance from Earth increases. There is no true boundary between the Earths atmosphere and outer space. At 120 kilometers above the Earth noticeable effects can be detected on space craft reentering out atmosphere. The Karmin line is 100 kilometers (62 miles) above the Earth. It is considered by some scientists as the boundary between our atmosphere and outer space. Troposphere The troposphere extends from the surface of the Earth upward 9 km (30,000 feet). The Earth's surface warms this layer of the atmosphere creating warm air thermals that mix the air in this layer. The temperature of the air decreases with altitude 6.5 degrees Celsius for each kilometer above the Earth's surface. The height of the Troposphere is greater at the equator than at the poles. The temperature is -45 degrees at the poles and -75 degrees Celsius over the equator. The air that we breathe is suitable for life on our planet only in the troposphere. Stratosphere The stratosphere begins above the tropopause which is the boundary between these two parts of the atmosphere. It extends to 51 kilometers (170,000 feet) above the Earth. The air increase in temperature in this layer as the ozone molecules absorb ultraviolet radiation from the Sun. Mesosphere The mesosphere extends from the upper boundary of the stratosphere up to 85 kilometers (280,000 feet) above the Earth. Shooting stars (meteors usually burn up in the part of the atmosphere. It is also the coldest place on Earth. At the boundary with the thermosphere the average temperature is -85 degrees Celsius. Water vapor is frozen in this layers forming ice clouds. 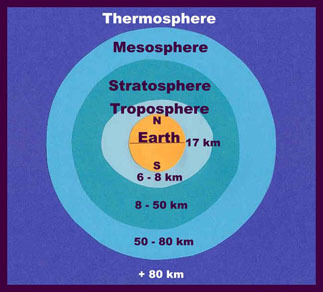 Thermosphere The temperature in the thermosphere increases until it reaches the thermopause where it remains constant. The temperature at in this layer can rise to 1,500 degrees Celsius. The molecules are so far apart they can travel a kilometer without striking another molecule. The Aurora Borealis occurs in this layer and the International Space Station is located in the thermosphere. The upper limit of this layer varies with solar activity from 350 to 800 km above the Earth. The Karmin line lies in the lower part of the thermosphere. Exosphere The exosphere contains hydrogen and helium. The individual particles are spaced so far apart they can travel hundreds of kilometers before striking another molecule. The particles migrate into and out of the solar wind in this part of the atmosphere.